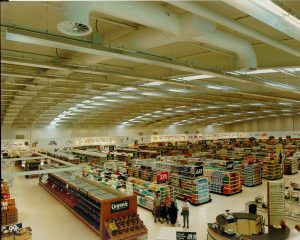 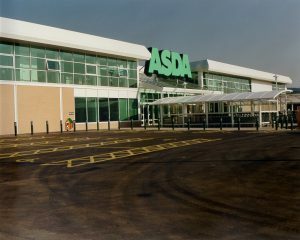 Each and every aspect of a typical Asda 60,000ftsq sales floor store was poured over, value engineered, rationalised & redesigned in a partnering arrangement with Kajima UK in a effort to reduce on site construction time to half that previously taken, hence the project title – Target 15. 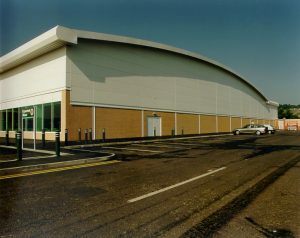 This target was reached using a combination of off-site fabrication, modularisation and teamwork involving an in depth analysis of the critical path on the project programme. 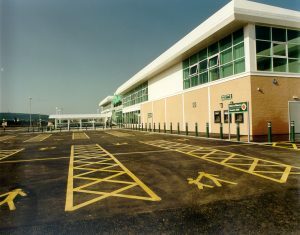 The store may not appear particularly different to others but it has a number of features which differentiate it from it’s contemporaries, ie the front of house was prefabricated in Hull, the central structural columns were removed to give an entirely flexible open space, there is an underground man-size service duct which frees the store of aerial servicing and the walls of the store are prefabricated brickwork panels.